Blessing Egbe, producer of highly successful television series, “Lekki Wives” is set to release her latest feature film, “One Room”. According to the prolific producer, the decision to release “One Room”, a movie which features multiple award winning actress Rita Dominic in the lead role is to employ the opportunities that technology provides in the light of the challenges that piracy has continued to pose to the creative industry in Nigeria. 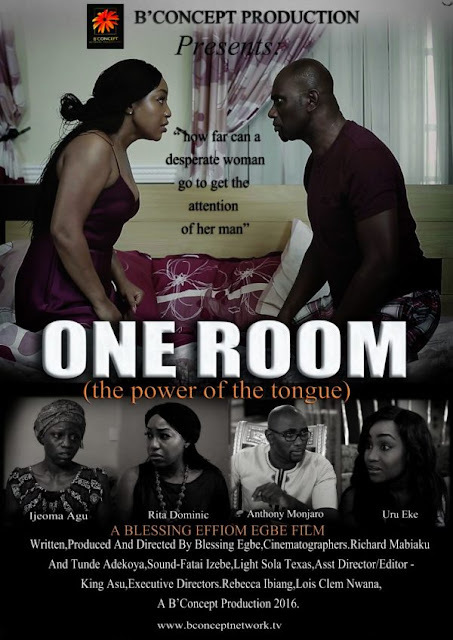 “One Room”, which along with Rita Dominic, stars Anthony Monjaro, Uru Eke Malachi Hart, Ijeoma Grace Agu and Cassandra Odita speaks about the trials and triumphs of the family. Without detracting from good quality set and production, it tells a relatable story that is rapidly becoming history in the film making industry in Nigeria. “One Room” is written, directed and produced by Blessing Egbe for B’ Concept Network Productions.